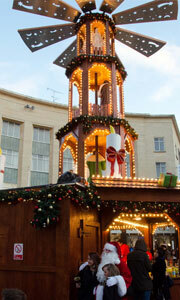 A key feature of the market will be the huge, 13-metre high 'Christmas Pyramid', with a giant rotating nativity scene ,which will be the focal point of the market's location in Broadmead alongside the new skate rink From Sunday 2 November an advent calendar window will be opened daily at 4pm and Santa will be giving away free presents to some lucky children. This year's Entertainer is Der Alpen Klaus. Klaus does a lot of Entertaining at the Munich Beer festival and similar events all over the country. But he not only delivers Bavarian style music he also does his own versions of popular music. For the Xmas market he will deliver a lot of Xmas style music on top of ´his repertoire with consist of over 500 titles. From Sunday 2 December to 24 December an advent calendar window will be opened daily at 4pm. Santa will ring his bell around the market and then will be giving away free presents to some lucky children. The Christmas nativity scene and advent calendar are very popular and will remind us of the origins of this special time of the year.